At a sit-down with Adina Grigore, Sprout Skin Care founder and holistic nutritionist, I got the scoop on what to eat for healthier skin. Her #1 tip: keep water in and toxins out. Brighten your complexion with these face-friendly diet tweaks. • Drink water. It helps your skin cells stay firm, and keeps toxins moving out of your system. • Eat healthy fats like those found in avocado, salmon, and most nuts to help cells hold onto moisture. • Add foods with antioxidants (bright fruits and veggies) and fiber to your diet. They latch onto toxins and help move them out of your system. To note, Grigore’s skin care line is based on a “keep it simple” philosophy, which means a short ingredient list (5 items or less) made with stuff you can find in your kitchen. For example, apple cider vinegar (found in the Sprout toner) is pH neutralizing so you can use it straight out of the bottle to spot treat pimples, which are usually caused by skin being too basic or too acidic. 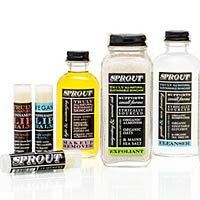 A must-try: Sprout Makeup Remover ($12; sproutskincare.com). It’s made with a trio of oils (sweet almond, olive, and jojoba) that get off makeup without irritating eyes or leaving behind a greasy residue.